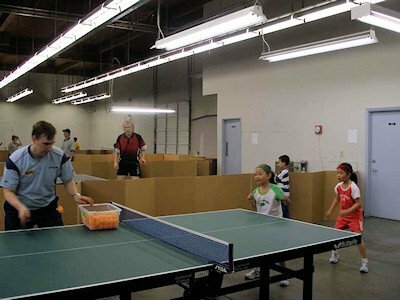 Willamette Table Tennis Club is located in Salem, Oregon, USA. Our address is 1960 Oak St. SE, Salem, Oregon. The club has nine open tables (six Joola and three Stiga), plus a tenth table with a robot for free use. Four of the tables are on professional level floor mats, while the others are on concrete. The lighting has been upgraded to equal the best available in any US club. We host regular small, non-sanctioned tournaments and twice a year we bring in Stellan and Angie Bengtsson for advanced training camps. Visitors welcome, $4 per visit, beverages $.50. 1:00 to 5:00 on Saturdays. Monday night is beginner's night, where the more advanced players spend the evening coaching beginners and recreational players. Hours are 7:00pm to 9:00pm. Past coaching by Sean O'Neil, Tina Chen, Xi Guo, Angelita Rosal Bengtsson, Stellan Bengtsson.